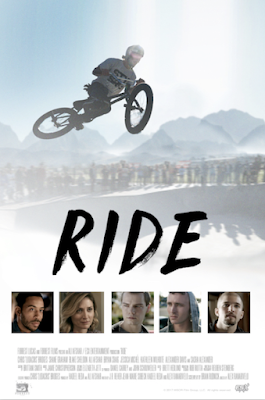 Ride stars Ludacris (Fast & Furious), Shane Graham (Boyhood), Sasha Alexander (“Rizzoli & Isles) and Blake Sheldon (Gone Girl). A troubled youth from a white supremacist family is sent to a juvenile detention center by the courts after a violent incident at 8 years of age. After spending the better part of his childhood locked up, a persistent social worker finally finds him potential foster parents. He becomes hopeful until the foster parents arrive and he discovers that his foster father is black. With no better alternative, he agrees to go home with them. Things are tumultuous at first, but the foster father is determined to get through to him. When he discovers his foster sons fascination with BMX and teaches him how to ride a bicycle, the two start to form a bond and helps thrust him down the path to BMX glory.